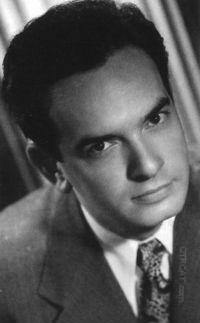 was a radio staple and performed in hundreds of radio shows in both the comedy and drama genres. In Suspense alone, she stared in over 120 episodes. She is best known for her role as narrator and best friend Jane Stacy in My Friend Irma. It cannot be argued that radio during the Golden Age was a huge industry that put dinner on the table for thousands of people and their families. 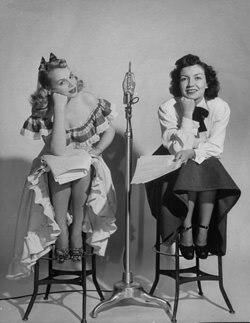 Network radio was also a shared experience for millions across the country, from bachelor farmers on the plains of North Dakota, to the hippest teens listening on the stoop in front of their New York City home, to young mothers catching up on their soap operas while doing their ironing, to servicemen whiling away their long hours on remote bases overseas. As big and important as the network radio industry was, it is interesting to see that there was actually a fairly small cadre of actors who appeared in a majority of the era's popular dramas. To be sure, there were certain names who became big on one program or series of shows, and these actors got so big that it was an event when they were a guest on someone else's show, but many of the most popular series were peopled by a group of professionals that producers knew they could depend upon. One of the reasons for this relatively small talent pool had to do with Hollywood's “Radio Row”. In New York, the networks each had an acting staff who would work on several different shows, but the players tended to stay with their parent network. In sunny Hollywood, studios for all of the networks were clustered within steps of each other near the intersection of Sunset and Vine. NBC was right on the corner, ABC just across Vine, Mutual a few doors down Vine and CBS Columbia Square nearby on Sunset, so everyone in radio frequented the same watering holes and knew each other. Most of them followed remarkably similar paths into radio and movies. Cathy Lewis grew up in Spokane, Washington, the daughter of Inland Empire pioneer physician and pharmacist David H. Lewis. In the mid-1930's she went to Minneapolis to study with a repertory theater company and became a vocalist for big bands under Herbie Kay, Ray Noble, and Kay Kyser. She made her way to Hollywood, acting at The Pasadena Playhouse and hoping to break into movies. She found a few small roles and toured for a year with Alexander Woollcott's “The Man Who Came to Dinner”. After time on the road the place for regular work turned out to be Radio Row. Cathy Lewis spent 35 years of her mere 50 years on Earth in show business. Immensely talented, Cathy Lewis performed in thriller radio shows like Suspense to comedies like My Friend Irma. Born in Spokane, Washington in 1918, Cathy Lewis got her start as a singer for Kay Kyser. In the old time radio comedy genre, Cathy Lewis had as repeating role as School Principle Irene Henshaw in The Great Gildersleeve. 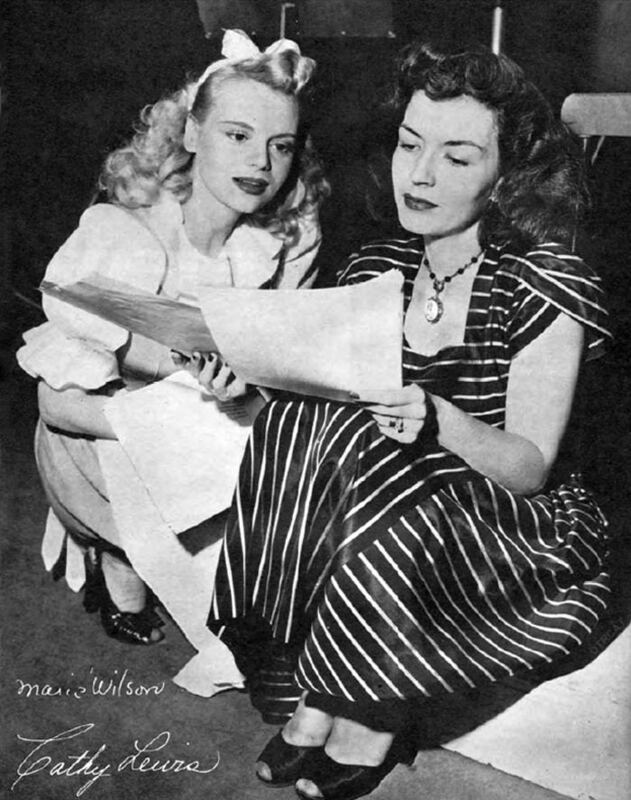 She was the star and narrator of My Friend Irma as Irma's (Marie Wilson) sensible best gal pal Jane Stacy. In drama, Cathy Lewis a regular on Suspense, and performed in over 120 episodes including "The House in Cypress Canyon" and "On a Country Road" with Cary Grant. She also performed as the monotone and unsympathetic phone operator driving Agnes Moorehead into hysterics in Lucille Fletcher's "Sorry, Wrong Number." Lewis and Moorehead performed together again on Suspense in "Don't Call Me Mother." Cathy Lewis and her husband Elliot Lewis (same surname) worked together frequently on Suspense and other shows. The Lewis' began to be billed as "Mr. and Mrs. Radio." On January 1, 1953, they got a chance to showcase their talents together when they created On Stage. The show is exceptional and the time highlights the dramatic abilities of this dynamic duo. Arch Oboler put her to work as a sympathetic feminine voice in several episodes of Lights Out (Cathy is rumored to have played Boris Karloff's feline bride in the immortal “Cat Wife”), and she was frequently in the company of Lux Radio Theater. In 1943, she met and married fellow Radio Row regular, Elliot Lewis. That the couple had the same surname led to some good-natured ribbing amongst their friends. Cathy herself joked "Miss Lewis married Mr. Lewis, so Miss Lewis became Mrs. Lewis. I didn't have to change my driver's license. I could have changed my name to 'Cathy Lewis-Lewis'." The “Lewis-Lewis” team shared the microphone on several occasions, but there most popular roles were separate. “Mr. Radio” Elliot Lewis is best remembered as Phil Harris's dipsomaniac sidekick Remley from the Phil Harris-Alice Faye Show. Cathy's biggest radio role was as the sensible narrator and roommate of My Friend Irma. Kathy also appeared in the film and TV versions of My Friend Irma, which were much more successful than her appearance in 1959's attempt to bring Fibber McGee and Molly to the small screen. The year before, the “Mr. and Mrs. Radio” team split through a divorce. Breast cancer took Cathy Lewis on November 20, 1969, the ninth anniversary of her father's death. I used to hear her once a week on My friend Irma. She was also on the Great Gildersleeve for a while. She had a very distinctive voice. Once you got to hear her a few times, you always knew it was her.